In the late autumn, he receives a telegram from the OAC chemistry department, offering him a position as a full-time assistant instructor in quantitative analysis. Though it means a pay cut of $25 a month, he accepts the offer in order to get back to college. Back on campus, he rejoins the Gamma Tau Beta fraternity, now housed on North 26th Street. His office is in the chemistry library in Science Hall, where he begins reading the scientific journals. He discovers the papers by Irving Langmuir on the electronic theory of valence and by Gilbert Newton Lewis on the arrangement of electrons in atoms and molecules. Lewis’s ideas on chemical bonding, especially the shared electron-pair bond, have an immense influence on Pauling. At one of the few research conferences ever held by the OAC chemistry department, Pauling gives a report on molecular structure and the nature of the chemical bond according to the theories of Lewis and Langmuir. After spending the Christmas holidays with his family in Portland (where he is upset by a quack doctor who is ministering to his mother), Pauling returns to Corvallis for the three-month second term. Pauling teaches from January through March. He has 83 students in three courses. One of these courses is a low-level general chemistry course for agriculture, home-economics, and engineering students. His other two courses are in quantitative analysis, one for mining engineers and the other for chemical engineers and pharmacy students. Paul Emmett is a member of one of his quantitative-analysis sections. At the end of the winter term, Pauling considers leaving OAC, because its emphasis on a technical education no longer appeals to him. John Fulton, the head of the chemistry department, tells Pauling about a notice he has received from the California Institute of Technology (Throop College of Technology was the precursor of the new institute, which has new faculty, new programs, and a new philosophy). 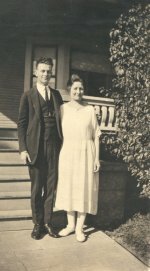 Pauling writes to Arthur Amos Noyes about his interest in coming to the California Institute of Technology, but it turns out that he is financially unable to make the switch. During the summer, Pauling works again for the Oregon State Highway Department. He is able to save enough money to return to OAC as a junior. In the fall, Pauling returns to the Gamma Tau Beta fraternity and takes up his program as a chemical engineer. He is also an assistant to Samuel H. Graf in a mechanics and materials course. His courses include organic chemistry, which he finds theoretically sterile and therefore uninteresting. Floyd E. Rowland, a thirty-five-year-old Iowan in charge of the chemical engineering department, encourages Pauling to go to graduate school. On February 3, Pauling is runner-up in an oratorical contest. His speech, "Children of the Dawn," is outstanding, but he loses to an older man who is a preacher. After his usual summer job, Pauling returns to Corvallis in the fall, when he moves into Gamma Tau Beta’s new location at 31 North 26th Street (later in the school year, he helps obtain a charter from Associate Justice Charles Evans Hughes of the United States Supreme Court for the Oregon State Chapter of Delta Upsilon). During the fall term, Pauling continues to work as an assistant in mechanics and materials while taking a very heavy load of senior courses. He takes physical chemistry, for example, but, because of the way it is taught, he develops "a distaste for the subject," enjoying much more the statics and dynamics that he studies in his mechanical engineering courses. Pauling does his first research, a project in which he investigates the effect of magnetism on the orientation of iron crystals when they are electrodeposited from an iron salt solution. On December 17, Christmas recess begins, and Pauling encounters Walter Scott at the Corvallis railroad station. Scott, a freshman chemistry teacher, tells Pauling that the department needs to hire four seniors as part-time instructors of freshman chemistry. Pauling, in need of extra money, agrees to be one of them. For the second term, Pauling teaches 25 home-economics girls and meets, for the first time, Ava Helen Miller. As the term proceeds, his attraction to her (and eventually her attraction to him) develops. In March, Pauling and Ava Helen Miller begin dating. During the spring term, their dating becomes more serious. Some people view this as improper, but, according to Ava Helen, they do not run into any insuperable problems "because Linus maintained his objectivity in class." 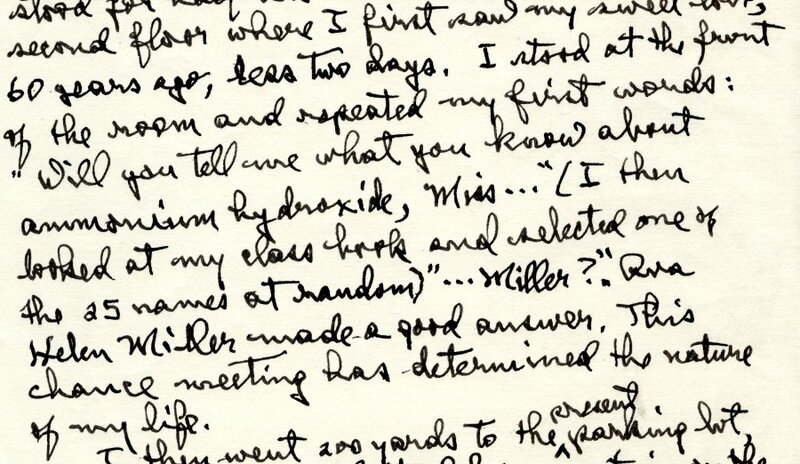 Linus Pauling's account of his first meeting with Ava Helen Miller. Pauling, who has decided to get a doctorate in chemistry, applies for fellowships from the California Institute of Technology (CIT), Harvard, the University of California in Berkeley, and a few other universities. He first hears from Harvard but is disappointed with their offer (only a half-time instructorship and a probable time of five years for him to get his doctorate). His next offer comes from A. A. Noyes at CIT: a $750 graduate assistantship that would allow him to get his doctorate in three years. He accepts this offer without waiting to hear from the other schools. Pauling also applies for a Rhodes Scholarship to Oxford University (Paul Emmett does, too). Neither Pauling nor Emmett receives the scholarship. By the end of the spring term, Pauling and Ava Helen Miller wish to marry, but this is opposed by Belle Pauling and Nora Gard Miller. Linus and Belle Pauling, 1922. On June 22, Linus Pauling graduates from Oregon Agricultural College. His grade average for his four years of college is 94.29. He is class orator and gives a speech at the graduation ceremonies. During the summer, Pauling works again for the Oregon State Highway Department, this time in the paving of a highway along the Pacific Coast near Astoria, in the northwestern corner of Oregon. He works through the physical chemistry problems in a textbook sent to him by Noyes. He also reads X-rays and Crystal Structure by William Henry Bragg and William Lawrence Bragg, the father-and-son team who successfully applied X-ray diffraction methods in determining the structures of many important crystals. At the end of the summer, Pauling again expresses his wish to marry Ava Helen Miller, who accepts, but Nora Miller and Belle Pauling successfully intervene, and Pauling departs for Pasadena and Ava Helen begins her sophomore year at OAC. 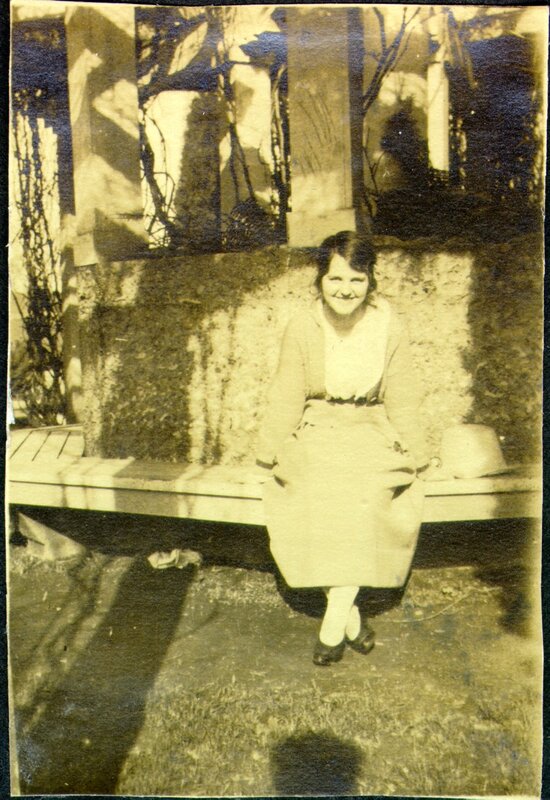 Ava Helen Miller, Salem, Oregon, 1920.